Well, just trolling around the 'net and I read this story from CNN about two young girls who a robbed a bank. 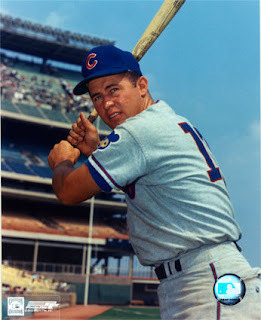 Ron Santo not being elected in the National Hall of Fame is a shame. Yesterday, the Veterans Committee had a chance to vote on electing new members into the Hall Fame, and they chose no one. The names from the list included, Jim Kaat, Marvin Miller, Gil Hodges, Tony Oliva, Doug Harvey and the aforementioned Ron Santo. 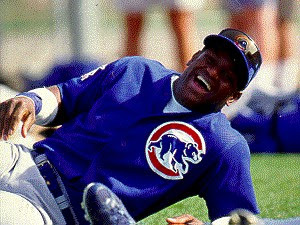 There are far worse players than Santo in the Hall of Fame, and although I am not a Cubs fan at all, there’s something about him that is very endearing. I was not born when he played, but when I visited Chicago’s Wrigley Field solo, chatted and made friends with few fans, I mentioned Santo’s name and all I heard was endless stories of how awesome of a Cub he was. For those of you not familiar with him, Santo in Chicago has a stature of a Cal Ripken in Baltimore, or a Robin Yount in Milwaukee, or a Tony Gwynn in San Deigo, or a Stan Musial in St. Louis. Maybe I like him because it’s the fact he still breathes the passion of the game although he’s been through so much health-wise and his body has been so ravaged – mostly due to diabetes. Perhaps I am empathic, but I know a quality ball player and person when I see one. Santo is it. The man hit 342 homers, collected 2,254 hits, finished with a .277 batting average and 1,331 RBIs in his career. Although his numbers do not hail in comparison some of the big sluggers of today, they exceed a lot of his peers when he played. Perhaps the committee is so in love with the bloated and perhaps supplement aided numbers of today, that they don’t see a quality ballplayer any more when it is in front of them. In the end, I hope Santo does get in. 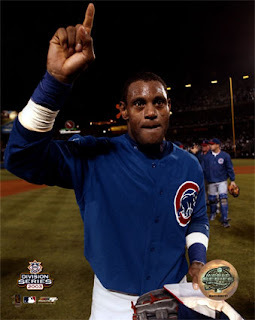 Though I am not a Cubs fan, he’s a good man and is proud example of the heart and soul of Chicago. Manny Being Manny – He wants to stay in Boston? The steroid debate will only intensify that much more now with the latest news. “According to various news reports, the feds raided two pharmacies in the Orlando, Fla., area on Wednesday and arrested four top company officials as part of a nationwide probe into the illegal distribution of steroids.The case, which is being led by a prosecutor in Albany, N.Y., involves several doctors, pharmacists and business owners who have been or will be arrested in Florida, New York and Texas. Other names also mentioned as a buyer is Jason Grimsley. Gary Matthews' reputation is probably soiled, especially considering the year he had in ’06 in comparison to his career numbers. His life is about to become a little more interesting. The Baltimore Sun’s Jeff Zrebiec has an article on the addition of the Spanish speaking coaches, Juan Samuel & Sam Mejias and their influence on the team, especially with the Latin players, such as Miguel Tejada. 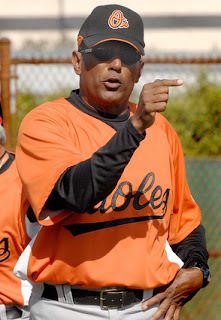 It’s an interesting read and takes a look into the Latin culture and impact on the Orioles. Roch Kutbako has an article on John Parrish and his comeback from ligament surgery after being out in late 2005 and all of 2006. As well, he updated his blog on the first intra-squad game. The Orioles.com Spencer Fordin gives us the updated on Kris Benson and he hopes to avoid surgery. As well, Fordin answers his mailbag on Miguel Tejada and his streak, as well as notes O’s manager Sam Perlozzo has named his starting rotation for spring training. The Washington Post’s Jorge Arangure also has an article on John Parrish & and lets us know that Kris Benson is still in pain. The Examiner also has a piece on John Parrish. Well, in the United States of America, voyeurism, stupid behavior and celebrity go hand in hand. As I often tell some co-workers, watch what you do and be very careful what pictures and video you take because they may end up on My Space, Facebook or somewhere that you don’t want them. Those things may come back to haunt you. This week, Ms. Antonella Barba has found that out. American Idol contestant, Ms. Barba, in the latest scandal to shock the juggernaut TV show is shown in racy pictures, a lot in uncompromising and not so flattering poses. Her pictures have flooded the internet, and she’s now the newest staple and flavor of the week on all the talk shows and cable TV news. Now a close friend of "American Idol" semi-finalist Antonella Barba says that the aspiring singer was not in the racier pictures out there. Some of them might indeed be photo-shopped or whatever, I don’t know. In my opinion, what people have done in their private life is their private life, and frankly, I don’t care to know. At this point, we have made people celebrities with even scarier backgrounds (case study: 50 Cent) with his record, than the alleged poser, Ms, Barba. I don’t see the big deal, but it should serve to kids, especially the ones looking for public office or something in thee public domain, not to take such racy pictures and let them come back to haunt you. One night of fun with the gals and the boys in perhaps an alcohol moment may cause a lot of pain. Damn, Y’all Make Ugly Women! : The San Francisco had another rendition of “Giants Idol”. “...the two-day "American Idol" takeoff that features mostly rookies, benefits charity and helps the club get to know each other through light-hearted humiliation hilarity. Last year's inaugural event raised $6,000 for a local charity and proved to be a hit among players, who apparently valued the bonding. This year's opening round was a huge rip-off, as it lacked the Kodak moments from last year, when Travis Ishikawa ripped off his pants to reveal Speedo underwear and Barry Bonds emerged from the clubhouse in drag as Paula Abdul. This time, there was much more lip-synching than actual singing, and it was The Other Barry's turn to portray Paula. Infielder Rich Aurilia filled the role of Idol judge Simon Cowell, tearing Kevin Frandsen apart after his rendition of Afternoon Delight - Anchorman style in a sky-blue blazer, white turtleneck and hot double-knit checkered slacks to enhance his wig and fake mustache. Outfielder Ben Copeland was bare-chested except for a purple vest and a striped tie, completing his rocker garb with skintight faux black leather pants cut off below the knee. After struggling through the Red Hot Chili Peppers' "Around the World" he revealed a tattoo on his torso the read "Born Bad." Mouthing "Fly Me ToThe Moon," right-hander Tim Lincecum wore a dark suit and fedora while clutching a cigarette in one hand and a pretend stiff drink in the other. Right-hander Matt Palmer, who actually relied on his own voice, sang Hank Williams Jr.'s "Country Boy Can Survive" wearing a 10-gallon hat, overalls and boots. The competition will continue Monday when Fred Lewis, Eugenio Velez, Steve Holm, Eddy Martinez-Esteve and Ivan Ochoa will be the headliners. Honus Wagner’s Card: From CNNsi.com - The "Holy Grail of baseball cards,'' the fa mous 1909 Honus Wagner tobacco card once owned by hockey great Wayne Gretzky, has sold for a record-setting $2.35 million, the seller of the card said Monday. Bobby Abreu: Yankees right fielder Bobby Abreu is expected to miss at least two weeks after significantly straining his right oblique during batting practice on Monday. The team hopes he’s ready for the regular season. Manny Being Manny – He shows up to work early, um, or late? Manny Ramirez returned to Red Sox camp Monday, although the organization expected him to be in camp on March 1st. Johnny Damon: Johnny Damon rejoined the Yankees on Monday after a two-day excused absence to tend to what he described as a personal matter. The Mitchell Investigation: The players' association will offer advice but said it's the choice of each individual whether to cooperate with former Senate Majority Leader George Mitchell's investigation into steroids use. I still think it would be in the best interest of baseball to cooperate, but since Mr. Mitchell has no power, the players are not compelled to do anything – thus, nothing will get done. More on An Old Friend - Sir Sidney: Big lush (perhaps former) & lover of life, Sidney Ponson might be unable to come the United States for nearly two weeks because of a Visa issue. He is scheduled to obtain his visa is on March 9th in Santo Domingo, Dominican Republic, the day of the Twins' 10th spring training game. Apparently, an immigration lawyer advised Ponson to get the wrong type of visa. Most players obtain P-1 visas - earmarked for international athletes - in order to play here in the big leagues. He was advised to obtain an O visa, one that is "specifically for the admission of persons with extraordinary ability in the sciences, arts, education, business and athletics", not usually reserved for athletes who plan to stay in the country long term (thanks for Babes Love Baseball for the tip). Derek Jeter punked in a Topps Card? One of my peers who love the Spankees, I mean Yankees, sent an email to an article in the NY Post about a Topps card that had both Mickey Mantle and President George Bush superimposed in it. From the NY Daily News: "The mischievous elves at Topps then played another version of Where's Waldo - sticking a picture of Mickey Mantle in the dugout. The Mick is depicted in uniform, holding a bat as though he were back from the dead and preparing to pinch hit. "Somewhere in between the final proofing and its printing, someone at our company - and we won't name names - thought it would be funny to put in Bush and Mantle," said Clay Luraschi, a spokesman for Topps. When the cards were proofread, Luraschi said, "We couldn't do anything but laugh. "Okay, it's in the set and it's funny," Luraschi conceded. "It's caused quite a stir." Jeter's card, No. 40 in the set, instantly becomes part of the card-collecting hobby's "long tradition of silly little error cards or odd prints that have taken on a lot of mileage in hobby lore," said T.S. O'Connell, the editor of Sports Collector's Digest, a 33-year-old weekly publication. "For collectors, there's a real giggle factor for something like that," O'Connell said. All in good fun - nice. The Baltimore Sun's Ray Frager reports more on the Orioles' radio policy about team executives and coaches taking calls from fans only on CBS affiliates (WHFS and ESPN 1300), and not from outside radio entities. A little scare for O's fans -- Hayden Penn twisted his ankle & may turn affect his chances of making the team. However, he's day to day and should see action this spring. Roch Kubatko has some news on Radhames Liz and an unusual sound he makes when pitching. The Baltimore Sun has a Q&A with Chris Ray along with writer Jeff Zrebiec, and Jay Payton not concerned about his playing time. The Washington Post's Jorge Arangure has a great article on Nick Markakis going into year two, and he's got more on the Hayden Penn injury. Recently, the Baltimore Orioles have instituted a new policy about talk radio and the fans who call into the various shows in the city and the surrounding area. According to WBAL, Orioles management, including Jim Duquette and Sam Perlozzo have been barred from taking calls from fans from stations besides CBS affiliates, ESPN 1300 or WHFS 105.7 (from wbal.com). He says "They’re both great guys and wonderful interviews, and enjoy their interaction with the fans. I’m very disappointed for the listeners and callers. We had people call in to talk to them, as they always have, and Perlozzo and Duquette were told by the Orioles that they couldn’t interact with the listeners." Oriole Magic’s Mike Boehm goes off about this issue in an eloquent fashion, and I can hardly blame him at all. 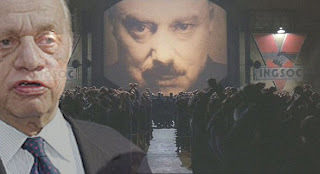 Like the mythical “Big Brother” in the novel, ‘1984’, it seems like the Orioles in order to have further control of their product want a greater say in what their employees say to media outlets. In a corporate sense, I can understand why it is done. However, in the world of sports, and especially talk radio which is fueled by debate and much as chatter, what the Orioles are doing sets a real bad precedent. Fans who buy the $9 seats to those who have spent tens and hundreds of thousands on corporate suites, the customer has the right to hold someone accountable for the product on the field and have a line open to voice complaints, or praise. The team is taking people’s money, and traditionally talk show radio has been a way to voice their concerns. Now, the new policy has taken the people’s voice away. That’s fine, and I understand why the Orioles would do it from a business viewpoint, but it is horrible customer service. This is not an issue about winning or about the last nine years of losing — it’s about fan interaction, accountability & the feeling that the higher ups care what the fans think, whether it be positive or not. I’m a huge O’s fan, and have been for years and it seems every year it’s harder to like the organization in spite of the losing. Maybe the Orioles’ brass will reconsider the new policy, but taking away the privilege of the fans to interact with team executives (a staple of talk radio) only adds to a further disconnect between the team and the fans today. If anyone from the organization reads this blog, hopefully you’ll reconsider the new policy – you’ve upset a greater number of fans out there. 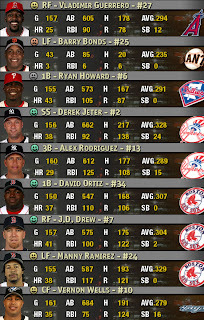 Well, here's some selected players I decided to pull from the simulation I did for the 2007 regular season using MVP Baseball 2005 modified for the upcoming season. Most of the players did what I expect them to do, and I'm so glad Bonds gets injured and misses breaking Hank's record. However, Derek will not 38 homers, and Alex Rodriguez will hit more than 29, and J.D. Drew will not 41 homers for the Red Sox. I'll post more players as I go along, and I'll do the pitchers later. If there's anyone whom you'd like to see, let me know. The Baltimore Sun has an article on Corey Patterson and how 2006 was a year of growth, not on the field, but in terms of his confidence with the team. Peter Schmuck has a piece on Kevin Millar and the long standing hair policy. Like I have said recently, I love the scruffy look (I often wear my hair very short cropped, to the point where it’s almost bald), and I think it adds a lot of character to the team. Rock Kubatko has news on Tom Treblehorn as he was in camp yesterday while dealing with his wife’s stroke, and he updates his blog with reflections from Sunday. The Washington Post’s Jorge Arangure Jr. has a piece on roster hopefuls Jeremy Guthrie and Luis Montanez, as well as more on Tom Treblehorn. The Baltimore Examiner has a piece on Scott Williamson. The Orioles team website has a piece on Miguel Tejada and how his offseason workouts and conditioning will serve him well into the 2007 season. As well, Spencer Fordin looks at the young starters, such as Hayden Penn along with Jeremy Guthrie and whether they’ll be with the big club, or in Triple-A. This is crazy - the whole case, the intrigue, the amount of baby's daddies coming out of the wood work, the media spectacle, and the incessant coverage of this case for the better part of two weeks. As a citizen, it is difficult to fathom a judge even taking an active part in this besides from being the moderator. Well, the judge, Mr. Seidlin became very much a part of this crazy, outlandish event with Howard K. Stern, Larry Birkhead and Anna Nicole's mom. Sheesh. I have no idea if this judge is performing, or just going well and beyond what his responsibilities are supposed to be, but this train wreck has morphed into a event within itself. Anyhow, view this video from Keith Olbermann's show on MSNBC, "Countdown". 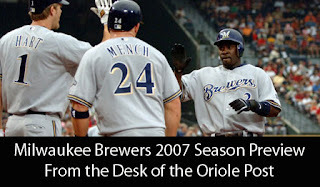 In 2006, the Brewers were seen to be a team on the rise mainly due to its young and talented starting corps and an electric collection of youngsters; however, it was not the Brewers year. With a litany of injuries, a pitching staff that didn’t live up expectations, and an offense lackluster at times, the Brewers only limped to a disappointing 75 wins.. Although the team had a season that did not live up to expectations, they have a great, talented core and should be primed to make an impact in the National League Central. All in all, the Brewers have nothing but a bright outlook for 2007 and the road beyond. During the winter, the team added NLCS MVP, pitcher Jeff Suppan and longtime veteran Craig Counsell via free agency, acquired Johnny Estrada, Claudio Vargas and Greg Aquino via trade; however, the Brewers lost infielder Jeff Cirillo, and pitcher Tomo Ohka to free agency, and Edward Campusano, Doug Davis, Dana Eveland along with Dave Krynzel to trades. Much of the promise for the Brewers comes with their starting pitching, and the top of the rotation is spear-headed by Ben Sheets and Chris Capuano, along with free agent signing Jeff Suppan. Ben Sheets has the stuff to be a number one starter, but his health will remain a question. He’s missed some time in the last 2 years, and went 6-7 with a 3.82 ERA in 2006 before he fell to injury. 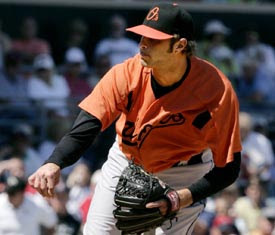 However, in 2004, he won 12 games, while losing 14, but struck out 264 batters, pitched 237 innings and had a 2.70 ERA. It will be critical for the Brewers for Ben to stay healthy, as it seems a lot of the team’s fortune depends on him. If he can stay healthy and duplicate the success he had in 2004, Sheets can easily be one of the elite pitchers in the NL and in all of baseball. Chris Capuano had a solid 2006 where he finished with 11 wins and a 4.03 ERA. His numbers from last season are in line with his 2005 stats, but he gave slightly more hits, and had 7 more wins. If he can get a few more wins under his belt, he’ll help out the team immensely. NLCS MVP Jeff Suppan will be the third starter, and he was a 12-7 with a solid 4.14 ERA. While he’s not an ace, he should be solid and has won 44 games in the past 3 seasons for the Cardinals. The bottom of the rotation will be manned by Dave Bush who was 12-11 with a 4.41 ERA, and Claudio Vargas who was 12-10 with a 4.83 ERA. Both men were solid last year, and if they could maintain their numbers or perhaps be better, the Brewers should have a solid staff that should be able to compete for the AL Central title. Let’s move onto the bullpen. The bullpen for the Brewers on paper looks strong; however, it had it share of struggles in 2006. Closing out games for the Brewers will be Francisco Cordero, who was part of the Carlos Lee trade. Although, Cordero struggles in Texas, he was golden with Milwaukee and finished the season with 10 wins and 22 saves. If he can find the form he had in the second half for the Brewers in ’06 and can tap into his 2004 success; Cordero can potentially be one of the best closers in the game. Derrick Turnbow struggled last year during the second half, and eventually lost the closer job after imploding in the second half. He finished the season with 24 saves, but with a 6.87 ERA; therefore, he should be the setup man going into 2007. Joining Turnbow and Cordero in the bullpen are Greg Aquino, youngster Jose Capellan, Brian Shouse, possible Dennis Sarfate & Matt Wise. The Brew Crew offense once again, will be fairly young, but they have some big bats easily capable of doing damage. Once again, count on Bill Hall, Prince Fielder to carry big sticks, and for Geoff Jenkins to fins his stroke again. The team now has even a greater infusion of young talent and will be exciting to watch; however, don’t discount the Brewers lack of experience – they have talent, skills and a good all-around game. Manning the infield will be big Prince Fielder at first base, Rickie Weeks at second, J.J.Hardy at shortstop, and possibly Corey Koskie. At first base will be imposing youngster Prince Fielder. He led the team offensively in pretty much every category as he hit .271 with 28 home runs and drove in 81 runs, but faded towards the end of season. He should be a force for the team in years to come, and he’ll only get better. Rickie Weeks will be at second base and ht .279 in 95 games. He drove in 34 runs, has some speed along with a good bat, and has a lot of potential although his defense was shaky at times. Weeks missed much of the second half with a wrist injury, and the team hopes his upside will led him to be force at the plate in the future. At shortstop will be J.J. Hardy who only hit .242 in 35 games, but was impressive in the field and should man the position every day in 2007. Right now, third base is in flux, as it’s unsure if Corey Koskie will return from post-traumatic concussion syndrome. He’s a solid veteran and his presence would be valuable to the plethora of young talent on the ball club. Koskie has a career .275 bating average and would help put the offense greatly if he could make a comeback. Backing up the infield will be Tony Graffanino, who can play all the infield positions and hit .274 last year; longtime veteran Craig Counsell who can play up the middle; & young Ryan Braun. Graffanino may see a lot of playing time if Koskie can’t return, or if some the youngsters struggle. The outfield will be manned by Geoff Jenkins in left field, Bill Hall in center, and Corey Hart in right. Geoff Jenkins numbers dipped quite a bit in 2006 from his number the past several seasons, as he only hit 17 home runs and drove in 70 runs. As the offense was weak last year, the Brewers will need him to bounce back to what he’s done previously or perhaps exceed it. Moving to center field from the infield will be Bill Hall, as he had a breakout 2006 where he hit 35 homers and drove in 85 runs. The team hopes he can learn the outfield, and as well as duplicate what he did last season in 2007. In right field will be Corey Hart who hit .283 in 87 games, and was impressive during the second half. Backing up the everyday outfield will be veteran Kevin Mench who came via the Carlos Lee trade and might see a lot of playing time; however, he struggled after the trade and should bounce back. Also fighting for playing time will be Gabe Gross, Tony Gwynn Jr., Brady Clark and Lance Nix. The everyday catcher will be Johnny Estrada who came via a trade with the Arizona Diamondbacks. Estrada is a great hitting catcher who batted .302 last season and drive in 71 runs. Longtime catcher Damian Miller will probably be the backup, but is well regarded for his ability to call a great game and for his defense. Heading into spring, the Brewers, if the pitching can hold up and the young players and offense improve from last year, they have a good of a shot as anyone in the National League Central. The team is stacked with young players all across the board, the team has so much talent and promise, and so they cannot be discounted as a contender in the National League. In the end, the Brewers should be exciting in 2007 and the future is perhaps bright in Wisconsin for the first time in a good while. 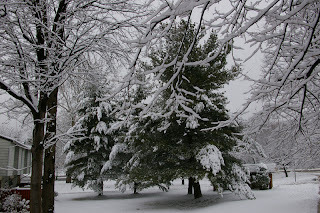 Well, it snowed about 3-4 inches here in Maryland, so I am just at home chilling out. Hope you enjoy the pictures and where ever you are, be safe. Look out in the next week as the Oriole Post grows bigger and better, as I am going to have a full fledged website online at http://www.oriolepost.com. I'll be going to spring training in Florida in two weeks, and I am going to make a road trip out of it, as I'll visit my little sister in Alabama who works for Auburn University. Expect a Brewers' season preview tonight or Monday, soon thereafter followed by the Diamondbacks. Well, a fellow blogger, A.J. Cordi gave sent me an email about Ebay Auction that the Cal Ripken Sr. Foundation is having for a pack of Big League Chew autographed by Cal Ripken. Thanks A.J. for the tip, and be sure to check out his blog! On eBay until Feb. 27, the Wm. Wrigley Jr. Company is auctioning off a limited edition pack of Big League Chew Bubble Gum signed by Cal Ripken, Jr. All of the profits will go towards to the Cal Ripken, Sr. Foundation. The foundation is a non-profit organization that helps provide baseball and softball to underprivileged children. The Wm. Wrigley Jr. Company is honoring baseball living-legend Cal Ripken Jr.’s monumental induction this July into the National Baseball Hall of Fame with the launch of the “Big League Chew Live the Dream” promotion. Fans can now bid on this one-of-a kind Big League Chew package immortalized with Ripken’s signature and caricature-likeness. Visit www.bigleaguechew.com for more information on the Live the Dream promotion and to learn how you could win a trip to watch Cal get inducted into the National Baseball Hall of Fame. At the time of this post, the auction price is up to $910. There are still three days left so I'm sure the bids will really begin to sky-rocket soon. For the auction site on eBay, click here. 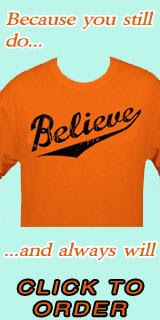 For the Cal Ripken, Sr. Foundation website, click here. Hey everyone, hope everyone is having a happy and great Sunday. 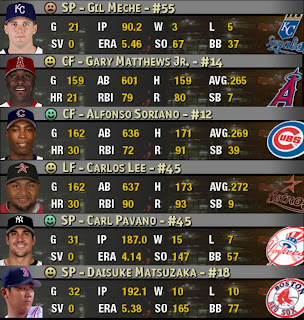 I decided to do a simulation of the 2007 season using a modified version of MVP Baseball 2005 for PC, with the updated rosters and schedules. Anyhow, here’s what comes from the simulation (Keep in mind, all the pictures came from a video game, and obviously has no bearing on reality, nor is it scientific). A lot of the results came out what I thought they would; however, some were off - way off. I'll have the playoffs done later on today or in morning. Right now, enjoy, speculate and feel free to leave me comments. American League East: I agree with the results, but I figured that the Red Sox would finish much better. The Orioles do finish above .500, though. American League Central: I don't see the Twins winning the division, and the White Sox should be at least 20 games better than they are record wise, but it does look like a very close race. American League West: The Angels should be in second, and will have a record above .500. 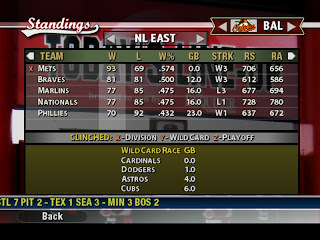 National League East: The Phillies should be in first or second, and there's no way they are worse than the Nationals. 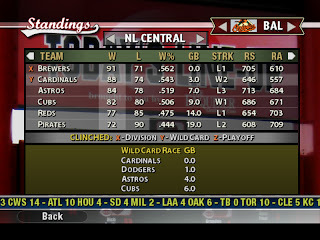 National League Central: I don't see the Brewers winning 90 games or the division, but it looks real competitive and close. The Cardinals sneak into the playoffs by winning the wild card. National League West: The Diamondbacks will win more than 68 games, but this division looks like how I'd rank all the teams. The Baltimore Sun’s Dan Connolly has a great article about Aubrey Huff, his mother, baseball and how they were able to get over the adversity of his father’s murder. Roch Kubatko updated his blog, and goes into the veteran presence on the team. Jamie Walker is still sore, and won’t use a screen after being hit in the head unless the O’s force him. There’s also a Q&A with pitcher Steve Green. The Washington Post’s Jorge Arangure has an article on the Stockstill brothers, executives for the Baltimore Orioles and talks about their roles on the team. He also has more on the Jamie Walker incident. The Baltimore Examiner also reports that Jamie Walker is fine. Jamie Walker is Doing Fine: Baltimore Orioles reliever Jamie Walker returned to camp Saturday after suffering a mild concussion when a line drive from outfielder Nick Markakis hit him in the back of the head during batting practice. Baltimore Sun writer Roch Kubatko updates us all on Jamie’s condition, and as well super-utility, lithe Brandon Fahey and Jon Knott. Feb 20 - Brian Roberts and the Orioles are in agreement that if he signs a contract extension with the team he will do so before the start of the season. "We don't want to put a set timetable or a deadline on it, but we certainly don't want it to extend into the season and be a distraction," Orioles Vice President Jim Duquette told the Washington Post. The Orioles haven't made a formal offer to Roberts, but he isn't concerned. "We all want to see this organization win; I certainly do," Roberts told the newspaper. "I don't want to give up on that because I think this city, this organization -- we have the pieces to do that." It will be a very good move on the team’s part if it is true, and it seems to be that Roberts will most likely sign an extension with the team at some point. News on an Old Friend (From Back in the Day): The Rockies signed outfielder Steve Finley to a minor league contract on Saturday as a non-roster invitee to the club's spring training camp. Johnny Damon will miss camp for personal reasons. The Big Unit, Randy Johnson feels fine in a session as he had off-season surgery. Jose Uribe hopes his legal troubles have subsided. Zack Greinke has been diagnosed with social anxiety. Dice-K looking good in his first batting practice outing. 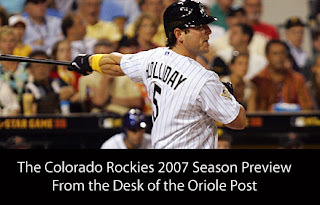 The Colorado Rockies in 2006 looked to be ready to take a big step to being a contender, as they were in the playoff race near the All-Star break; however, they faltered badly at the end, only winning 76 games. While some baseball experts may not consider the Rockies at all in the playoff hunt for 2007, they are loaded with young players all on the club and in the minors; therefore, the team has so much talent and promise. In light of it all, don’t discount the Rockies as a factor in the National League. With the emergence of Matt Holliday and several others, this season should be interesting in Colorado. For the team to make an impact, the pitching will need to step and move forward, and if the offense can repeat what they did last year, the Rockies could be a dark house in the National League West race. Much of the team’s core is back, but some additions and changes were made. During the winter, the team traded Jason Jennings to Houston for speedy Willy Tavares, and pitchers Taylor Buchholz and Jason Hirsch. As well, the team acquired Rodrigo Lopez in a trade, and signed pitcher LaTroy Hawkins - but, the team lost reliever Jose Mesa in free agency. With the trade of Jason Jennings, a quality starter, the young pitching will need to step up. The top of the rotation will be held by youngsters Aaron Cook and Jeff Francis. Cook was 9-15 last year with a 4.23 ERA. Simply put, for the team to go anywhere, Cook needs to show the promise he had in 2005 where he went 7-2 with a 3.67 ERA in 13 games. The second starter will most likely by Jeff Francis who was 13-11 with a 4.16 ERA. He’s only 26, and shows a lot of promise as his ERA in 2006 was more thana run and half less than what it was 2005; therefore, the team hopes he can build upon his success last season into 2007. Rodrigo Lopez will probably find himself in the middle of the rotation. As a Maryland resident, I know he could be a lot better than what he was in 2006 as lost 18 games with an ERA a tad under 6. He’ll be the wild card in the rotation as he is looking to bounce back after a horrid year. His track record shows that she should be good for double digit wins and ERA around 4. Hopefully the change of scenery will do him good. For now, it looks like the rest of the rotation may be decided in spring training. Other possibilities may be veteran Byung-Hyun Kim who was 8-12 with a 5.57 ERA in 2006 and has been up and down as a starter the last two years; Josh Fogg who won 11 games, but had a 5.49 ERA last season; Brian Lawrence who is trying to bounce back from a lost 2006 due to injury. Also factor in young Taylor Buchholz who was 6-10 with a 5.89 ERA for the Astros and as well, Jason Hirsch who had 3 wins and a 6.04 ERA in 2006, but was very impressive in the minors. The bullpen is not particularly strong, but it has some potentially good arms. Closing out games from the Rockies will be Brian Fuentes, who was solid in 2006 with a 3-4 record and a 3.44 ERA. Joining Fuentes in the bullpen is longtime veteran LaTroy Hawkins who will serve as bridge for the closer, Jeremy Affeldt, Ramon Ramirez, Manny Corpas, Denny Bautista & Tom Martin. The Rockies offense once again, will be a mix of young players and veterans, but they have some big bats easily capable of doing damage. Once again, expect Matt Holiday, Garrett Atkins to have big years for the Rockies. However, the big question is whether Todd Helton will bounce back and make the offense even more fearsome. The everyday infield for the Rockies will have Todd Helton at first base, a combination of Kaz Matsui & Jamey Carroll at second base, Troy Tulowitzki at shortstop, and Garrett Atkins at third base. Once again, longtime veteran Todd Helton will be manning first base and over the winter, he was the subject of trade rumors, most notably to the Red Sox. Although he still has a productive bat, he hit 15 homers, drove in 81 runs and hit .302; however, his numbers have gone every season in all categories and it’s been a cause for concern. In light of it all, he was sick for a stretch last season and it might have greatly affected him. He’s been nothing but one of the best offensive players in the game for the past decade, so he may have a comeback season in ’07. Second base will be a platoon position with Kaz Matsui & Jamey Caroll. Kaz Matsui was a bust for the Mets, but had a decent season batting .267 with 26 runs driven in. The Rockies are hoping he can play to his potential and perhaps still find the success he had in Japan. However, Jamey Carroll may get the majority of starts at second, but will also see sometime at shortstop and perhaps third. He got into 136 games, and hit .300, but he got recognition for his defense, hustle and his quality play. If Carroll can duplicate the success he had in 2006 and translate it into next season, the team would have found themselves a nice surprise. As well, he just signed a 2 year contract, so he should be in the fold for the team for a while. The everyday shortstop will be Troy Tulowitzki. The Rockies will be expecting big things from him as he only .240 in 2006, though he only played 25 games. He’ll be expected to bring offense and a strong defense presence to the team. At third base will be young Garrett Atkins who hit .329, hit 29 homers and drove in 120 runs. In his second year playing full-time, he put up some amazing numbers and became a pleasant surprise for the team. He may or may not regress in 2007, but there’s little doubt that he is a force for the Rockies. The backup infielders will be Jeff Baker and Clint Barmes. Baker can play the corners, first and third, as he showed promise last season hitting .368 driving in 21 runs in 18 games; therefore, Baker may also in line for a lot of playing time. Clint Barmes will be the other backup infielder, as he can play every position in the infield besides first base. The everyday outfield will have Matt Holliday in left field, Willy Taveras in center, and Brad Hawpe in right. Matt Holliday is the centerpiece of the offense, as he had a breakout season where he hit 34 homers with 114 RBI and batted .326. He’s only 27, and the Rockies hope he can maintain the same level of success he’s had the past several seasons. With Helton perhaps on the decline, the Rockies will depend on his power and ability to hit for average to lead the offense. Willy Tavares will be the everyday centerfielder, as he came to the Rockies via the Jason Jennings trade. He’s known for his speed, and it will be needed in the vast outfield in Colorado. He stole 33 bases in 2006, and the Rockies will need him to set the table for the offense. Brad Hawpe had a breakout season as well in 2006 where he hit 22 homers, drove in 84 runs and hit .293. He’ll probably split time with the aforementioned Jeff Baker in left. Backing up the outfield and competing for a spot will be Ryan Spilborghs, Cory Sullivan, Choo Freeman and Jeff Salazar. The everyday catcher will probably be decided in spring training, as longtime veteran Javy Lopez, Yorvit Torrealba & Chris Iannetta will compete for the job. 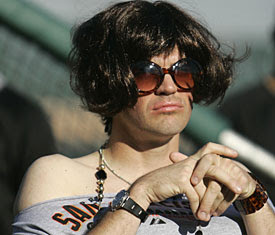 Javy Lopez is a longtime veteran and hit .251 between his time with Baltimore and Boston. Never known for being a great catcher, his bat is what has what made him such force in Atlanta. His numbers have gone down considerably since his big year in 2003 for the Braves, and the Rockies are hoping they can find the Lopez of old. Right now, he may be a backup, but in the end, if he’s got something left with the bat, he’ll serve the Rockies well. Also in the fold are Yorvit Torrealba was injured for a stretch in 2006, and he hit .247 in 65 games. Chris Iannetta will be 24 in 2007, and may be the catcher of the future for the organization, as he’s got a good bat and is a good defensive catcher. The Colorado Rockies play in a stacked division with the Giants, Dodgers, Diamondbacks, and Padres. While the Rockies are stacked with young players all across the board, the team has so much talent and promise, but it may fall short of being a contender because of the pitching. In the end, for the Rockies to contend, the pitching will need to step and move forward, plus the offense has to do their job. Therefore, if it all comes together, Colorado might have enough firepower for to be a factor in the National League West race. 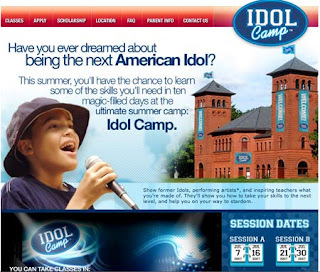 You Have Got to Be Kidding Me: Idol Camp? Sorry, I am going to step away from baseball for a second. Ok, we know American Idol has added a lot of music, content and contributions to the American lexicon, but now there’s a camp for it? The same people that brought us Kelly, Ruben, Clay, Bo, Daughtry, Carrie and Taylor want teens 12 to 15 to spend $2900 at a swanky camp for singing, acting, dancing lessons, and more. This is crazy! Fox is trying to bilk people for money so they can live out a dream, however, unrealistic? Thanks CNN.com and Perezhilton.com for the tip…. Well, a scary event happened in Florida yesterday, as newly acquired relief pitcher, Jamie Walker ended up with a concussion from a Nick Markakis line drive. Roch Kubtako has more on the incident and words from Nick Markakis, along with Sam Perlozzo. Also in the piece he has some bits from Paul Bako, & yesterday’s workout. The Washington Post’s Jorge Arangure also reports on the incident. 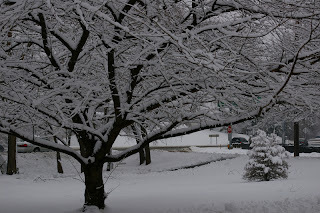 Roch Kubatko has his take of what happened via his blog. Also, Jeff Zrebeic reports that the O’s have few, if any prospects ready for the majors. There’s also a Q&A with Val Majewski. Jorge Arangure has a piece on the Canadian influence on the Orioles, most notably, Erik Bedard, Adam Loewen, Adam Stern and Steve Green. "I don't have to convince nobody," Sosa said Friday. "I know who I am. I have been good to this game, I will continue to be great to this game, I will continue to perform. ... I don't want to talk about whatever happened in Congress. This is not my problem. I've got to make the team." … "I just got here. Let me do my deal first and then I'll worry about the rest," he said. "I've got to take care of business. ... I'm going to go out there and do what (the Rangers) want me to do, show them what I've been doing. I'm in shape. Look, I don't have no belly." "I'm a little older. It doesn't mean I can't hit you 30 or 40 home runs," he said. "What's the deal? You think I'm dead? "… "I want to compete. Financially, I'm OK. I wanted to be here, wanted to play baseball. This is my life," he said. "I'm not coming back for 12 home runs. I'm coming back for more than that." "I don't want to talk about that," Sosa said. "Let's talk about baseball. Let's talk about 2007, and the talent we have in Texas, and what we can do this year." Well, good luck Sammy on your career resurrection. Even though you didn’t help us out in Baltimore at all, be well. 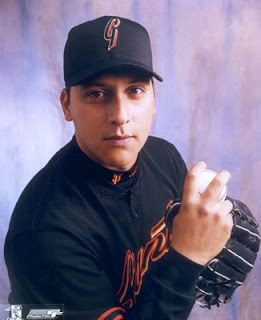 More on an Old Friend – Russ Ortiz: A man who gave fans heart palpitations and plenty of reason for fans to use f-bombs, Russ Ortiz much like Sammy Sosa, is trying to come back with the Giants, the team he broke in with. The Giants are taking a risk in signing Ortiz and hoping he can be a fifth starter. Tim Hardaway right now is one of the most disliked people in America. One of my favorite writers in America, Scoop Jackson interviewed Hardaway about his comments and how it's affected him. From TMZ.com – “Not only is Tim Hardaway the country's most hated gay-bashing bigot, but now TMZ has learned that he's being sued for more than $750,000 for skipping out on his mortgage, as well as rent payments on a car wash that used to bear his name. Nice. Such a fine example of what a person should be. In American society, you have the freedom of speech to say what you please. More often that not, most people enable a filter onto themselves in our politically correct world; therefore, celebrities do not to want to so much offend, but to save face and not hurt their careers. Bottom line, ignorance is ignorance and as great as the sporting world is, it can be the bastion of boorishness, intolerance and idiocy. Tim Hardaway, welcome to the Idiot File. Even though we live in a so-called tolerant society, ignorance and hatred always seems to find a crack in the surface. Hardaway, I was a Golden State Warriors fan back in the day when you roamed the floor with Chris Mullin, Mitch Richmond and yourself to create T-M-C. Ok, you all didn’t win anything, but you all made the game fun back in the day. "First of all, I wouldn't want him (Amaechi) on my team. "And second of all, if he was on my team, I would, you know, really distance myself from him because, uh, I don't think that's right. And you know I don't think he should be in the locker room while we're in the locker room. I wouldn't even be a part of that,"
When I heard this, it was one of those *WTF* moments and that an athlete who played in the NBA, one of the most image-conscious leagues in sports said that. Furthermore, you got his honest answer, and therefore there was no turning back. You know, I hate gay people, so I let it be known. I don't like gay people and I don't like to be around gay people. I am homophobic. I don't like it. It shouldn't be in the world or in the United States." However, Hardaway brought anti-gay thoughts out into the open. This is why and athlete will never come out, and it’s quite refreshing that someone was so honest with their feelings. He was honest to the point where he was comfortable to let his feelings be known without any thoughts of repercussions. Since yesterday, the NBA has banned him from all league sponsored events in the future, if not forever. Hardaway, later saying he regretted the remarks, apologized for the remarks during a telephone interview with Fox affiliate WSVN-TV in Miami. Maybe he’ll be joining Isisah Washington, and other countless celebrities in rehab for problems they didn’t know excited until they enlightened the nation. For those who are against diversity and programs promoting tolerance, Hardaway's attitude towards a segment of American society that's maligned for no other reason than their orientation still permeates our environment today. Yes, you can disagree with it, but homosexuals are no less of Americans and human beings than you or I.
I am working on a Colorado Rockies season preview, so expect it up on site later today or Saturday. Hopefully this weekend, I’ll wind up things with the Milwaukee Brewers and the Arizona Diamondbacks. As well, I’ll and start previewing the divisions and also story lines to watch out for this season. 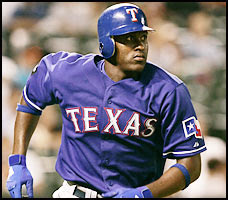 News on an Old Friend: The Return of Slammin’ Sammy: Well, Sammy Sosa arrived to the Rangers training camp on Friday. 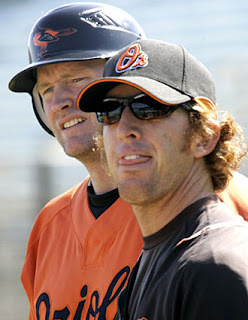 It yet remains to be seen how he looks, but he’s reunited with his first team and sorely wants to get to 600 home runs. I don’t know what he has left, but it will sure make things interesting if he makes the team. He was awful in Baltimore, and wore out his welcome with the Cubs, but if he’s got it, the Rangers will be a solid team from top to bottom. DirectTV and MLB: Bud Selig must not be happy about the latest news about his big TV deal. As of late, the government is investigating a proposed deal between Major League Baseball and DirecTV Inc. that has, well, um, made fans a bit upset (ok, very upset). I think it’s crazy that MLB would want to alienate customers, and some communities, especially some apartments, condo communities and homeowners associations may or not allow customers to install dishes on their property. The Baltimore Sun has a Q&A with the sometimes reclusive, yet awesome savior-in-the-wings lefty pitcher Erik Bedard. Roch Kubatko has a piece on Scott Williamson and how he feels going into camp coming back from surgery. Jeff Zrebiec has a piece on Jay Gibbons and updates on Kris Benson’s rehab. Ray Frager is excited about Gary Throne, and so am I. He’s a great play by play guy, and it’s was a great coup by MASN to get him. He also gives his take on the startup network and other news tidbits. The Washington Post’s Jorge Arangure, Jr. has a great piece on J.R. House and more on Kris Benson’s rehab, Jay Gibbons and the bullpen. The Baltimore Examiner has a piece on Russ Ortiz, and Cal Ripken visiting the Maryland State House. The AP has an article about the first base situation and the logjam for the Orioles. The orioles.com website has news on reliever Kurt Birkins, on speedy runners like Roberts and Patterson possibly having more freedom to steal bases, Garrett Olson and yes, on Kris Benson (for a guy who’s seen as average, I call him ‘Mr. Average’, he sure gets a lot of press). Orioles Magic looks at the Orioles and compares them to the competition in the AL East. Good job, Mike! The Roar from 34 blog has a great round up of O’s news and events, especially a take from Mets blogs about spring training, the Kris Benson injury and the Steve Trachsel signing. Oriole Central’s Ben has his thoughts about the Kris Benson injury and some other tidbits from the web. Check out the new O’s blog, Dempsey’s Army. Check it out and send them some love, as we could always use another Orange & Black supporter out there. I found two Cal Ripken related items online today. The first one comes from ESPN 1300, as he was on the ‘Anita Marks Show’ recently and sat down for an interview. You can find clip on the radio station’s homepage. The other Cal Ripken related item I found on the orioles.com message board. 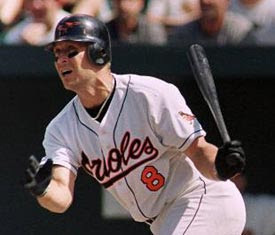 The writer, Chris Yandek from the Sports Interview Website had a conversation with Cal and they talk about ‘The Streak’, his induction into the Hall of Fame, the steroids and performance enhancing accusations around baseball, his involvement in baseball now & buying the Baltimore Orioles. It’s a great in depth interview, and there’s an audio file on the page as well. The Biggest Mercenary in Sports At it Again? 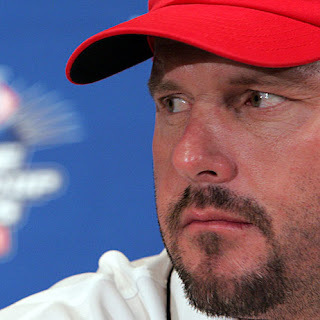 Well, Roger Clemens is flirting with baseball once again. He was at Houston Astros camp and threw pitches and hit grounders to Koby, his son. "Everybody knows where I stand. I don't care to play, but if that decision comes up again, then it's a big decision on me," Clemens said Thursday. "It has nothing to do with anybody else. It's a decision on me to go out and perform." Clemens said he's not "milking" his decision in search of the highest bidder. He also said he'll have no problem walking away when the time comes. "It's 10 times harder to make the decision to come back and try to do it again," he said. "I love what I do and I have high expectations to perform. When I don't, it's disappointing." "You come back to win, you come back to win it all," he said. "Your goals are set really high. I feel very flattered that those three teams still make an occasional phone call to the Hendricks brothers to ask where I'm at." We’ll see you again in June and find out who gives you the highest payday. 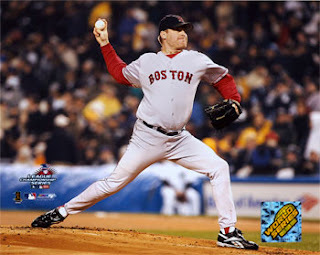 Curt Opts for Free Agency after ’07: The biggest mouth in the North, Curt Schilling, said he will become a free agent after the season and won't let that distract him during his fourth year with the Boston Red Sox. I agree with Theo. Results matter, and you just don’t give a 41 year old a contract unless you’re desperate. If Curt falters, much like Pedro, Johnny Damon and Derek Lowe, he may be sent on his way, as the Red Sox seem concerned with production and value, not sentimentality. I found this video too on Youtube, and it's a compilation of photos and moments from the 2006 season. A user, 'DaNumberOneFan' posted it onto the site and the Foo Fighters a song, "A Time Like This Plays" in the video. Anyhow, no matter if you're an Orioles fan or not - the best to all the players, managers, staff, media, fans and bloggers throughout the upcoming season. Wow. I found this on Youtube and this is from one of my favorite Simpsons' episode. I think is from 1990 or so and the episode is called "Homer at Bat". The Simpsons are my one of favorite shows, and it being the season of baseball - I decided to see what I could come up with. This video was done by Sol Rosenburg, and I love what he did with the song and some of the images from the particular episode. I am going to expand the blog, and will make the Oriole Post a full fledged website with video and also pictures of my trips around the country. As well, I’m going to start up a live radio show in the next few weeks and I am planning for the first episode in the next two weeks. I’m debating whether I want a half hour or one hour show, but it will be done live and then available for a podcast. I got presented with the opportunity and I’m going to take advantage of it. At the moment, I am in the beginning stages of planning and the format. I’ll probably have a co-host(s) as well get news and bits from some baseball experts, along with some bloggers and maybe if I’m lucky, sound bits, interviews and opinions from a player or two. If anyone would be interested in the opportunity, please let me know by emailing me at mdguy2415@aol.com. Erstwhile Baltimore Sun Writer and blogger, Roch Kubatko updated his blog this morning and gives us updates from the morning workout, plus a little about the mashers on the team. The Baltimore Sun has great Q&A’s from Jamie Walker, Adam Stern, & John Parrish. Another outfit I write for, MVN.com has a great article about blogging, the digital media and sports. Also, read Rob from Random Reality Thoughts and his take on blogging and sports marketing. The Church of Baseball took a road trip to NYC, so give the site a visit & look at some cool pictures and a great write up. Yankees Chick takes a look at the drama from the Bronx Zoo, temporarily in the Tampa area. * Anyhow, if anyone wants to let me know about their site, or anything worth taking a look at, email me at mdguy2415@aol.com!